Creamery Station’s early afternoon Friday set at the River Worm Stage was definitely one to remember. With a swift breeze under a canopy of maple leaves, the River Worm Stage offered a sanctuary from the 90 degree heat felt elsewhere. Promptly at 2:20pm, the familiar sound of Don DeStefano’s harmonica in the opening horns of “Whammer Jammer” started the tone of the show, defined by a mixture of blues, soul, and jam. Next, they slowed it down a little bit with a mellow afternoon reggae style “Stop That Train” highlighted by Mike Ryan’s expertise on percussion. After that song and to the surprise of the crowd, Creamery Station’s very own drummer, Harry Cooper, led vocals on the classic “Ophelia” by The Band. By this time, curious folk started meandering their way over from the Green River cobblestone beach area only about 150’ or so feet down the trail. Just in time for what seemed to be a crowd favorite, “Railroad Blues”, over 90 fans were grooving to the Creamery Station set. This was followed by an intense jam session in the well known song “Midnight Moonlight”. Various band members, including Dan Raucci on bass, Don DeStefano on harmonica, Jim Kader on guitar, and Jon Truelson on keyboard, alternated jamming flawlessly which ended in a seamless transition into “You Did Me Wrong”. Following the next song, “Out of My Reach”, the opening notes of The Band’s famous “Don’t Do It” got everyone hot-stepping again. By this time 120+ fans were crowding the area around the stage, such that people had to resort watching from the sides of the stage for a glimpse of the excitement. 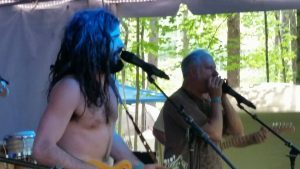 Creamery Station’s focus turned to the talented Jim Kader in the soulful Allman Brother’s tune “Ain’t Wasting Time No More”, which ended in a cheering ovation of gratitude by the crowd. At this point, with time winding down, the band started what they thought would be the last song of the set, the famous Jerry Garcia tune “Sisters and Brothers”. With Dylan Kader on vocals, it was evident that this deep jam really tugged at the heartstrings of the fans. After this tune, the crowd was heard chanting, “One more song, one more song…” To the delight of the fans, the sound crew signaled the band they had time for one more! In Dylan Kader’s pre-song banter, he indicated to the crowd that he was going to change it up a little bit by saying, “You know, our hometown is a small farm town in Bethany, Connecticut. So here is a little farm music to get your feet-a-moving.” Creamery ended the set with a wild bluegrass rendition of Woody Guthrie’s “Crawdad song”!